Acne can be tricky to treat unless you know exactly what is causing it. And figuring that out can be a problem - especially if your approach has been to just throw different kinds of lotions and creams all over your skin. Acne is a condition that usually reflects a problem that is happening INSIDE of your body, not what is happening to your skin directly. In fact, one of the most common reasons for acne that I've seen is due to thyroid hormone imbalances. Yes, other hormones can cause acne (we will talk about those as well) but thyroid problems tend to be more tricky to diagnose and treat so patients with this kind of acne tend to stick around for a while. If you've been suffering from acne by now I'll bet that you've done research on what you can do to clear your skin. You've probably tried multiple skin care products, lotions, creams, gels, etc. What you might not have realized is that if your acne is due to a hormonal imbalance then placing topical creams and gels on your skin will most likely NOT reduce your acne. So the question then becomes, what is actually causing your acne? When it comes to hormones everyone is aware of the "traditional" hormonal acne: breakouts on your jawline or hairline and very oily skin (usually accompanied by excess hair growth). ​This type of pattern is usually attributed to estrogen/progesterone imbalances. That's why pharmaceutical companies target birth control pills as a potential treatment for acne. And the crazy part is they do sometimes work, but usually, they stop working at some point (and this is usually when patients come to see me). I want to make a point here to say that while yes estrogen/progesterone imbalances can certainly lead to acne and breakouts - I think that acne due to hypothyroidism (1) is MUCH more common. ​And this becomes a problem because hypothyroidism is missed and/or mismanaged ALL the time. It's also VERY common with a prevalence of around 5-10% of the population (2) (depending on which study you look at). So if your acne is due to hypothyroidism and you are taking birth control pills to try and fix it, it will never go away. Not only that ​but remember that hypothyroidism leads to a number of hormone imbalances that could each lead to acne by themselves. ​The main issue in these conditions is the underlying cause which is usually hypothyroidism. Which means that in order to properly treat acne if it is due to hypothyroidism is to boost thyroid function either naturally or with the addition of thyroid hormone. How do you know what is causing your acne? Well, that can get tricky and it does require some investigative work. I will generally order all hormones when evaluating patients for acne and other symptoms. Usually, the main complaint isn't acne by the time someone comes to see me, but it is usually pretty high up on their list of important things they want to get taken care of. ​If your acne follows this pattern then it may be due to hypothyroidism and NOT another hormone imbalance. Though it's worth pointing out that hypothyroidism can make hormonal acne worse as well if not treated appropriately. I'm going to go over what to do if you believe your acne is due to hypothyroidism at the end, but first, we need to talk about GI function and acne. 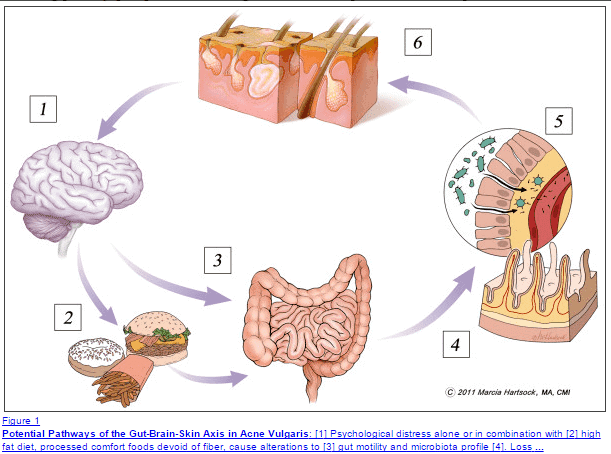 Another huge and often overlooked cause of acne is due to gut imbalances or issues in the GI tract. It turns out that changes in the bugs in your gut can lead to changes in your skin, including acne (5) (but also many other skin conditions). Hypothyroidism frequently leads to a condition known as SIBO. As many as 50% of hypothyroid patients (6) may have this condition (without knowing it). Hypothyroidism itself can cause acne by itself. Hypothyroidism can lead to hormonal changes that can lead to acne. Hypothyroidism can cause changes in the GI tract or gut that lead to acne. This is how hypothyroidism may be wreaking havoc on your skin and leading to acne. ​The treatment of your acne will largely depend on what is causing it. Let's say your problem is hypothyroidism but you also have GI issues contributing to your acne. In this, case you would need to address the hypothyroidism and address the gut issues as well. Generally treating the thyroid by itself may not enough if multiple imbalances are contributing. How do you know if your acne is caused by hypothyroidism? Generally, this type of acne follows a particular pattern and is associated with other systemic symptoms (listed above). The problem becomes how do you know if this is the case? ​I've written extensively on how to diagnose hypothyroidism through lab tests (and why lab tests really aren't the best way to diagnose hypothyroidism) that you can read about here. ​If you fall outside of these ranges AND you are symptomatic then your acne may be due to hypothyroidism. If that's the case then treatment would include naturally increasing your T3 and hormone levels or taking thyroid hormone. You can find a post on how to naturally increase your thyroid function here. ​For many of you, you will probably need thyroid medication to fix your acne. ​If you carry a diagnosis of hypothyroidism and you are currently being treated with Levothyroxine, then you may ultimately benefit from switching to a medication that contains T3. Often times patients do not convert T4 to T3 very well and despite being "treated" with T4 only medications (like levothyroxine and Synthroid) their target tissues may not be getting the proper amount of thyroid hormone. If that is the case then switching to medications like Nature-throid, Armour thyroid, NP thyroid or WP thyroid may be best. It's also possible that other factors may be playing a role in your acne (which we will go over below) so don't get down just yet. The second place you want to look is directly at your estrogen and progesterone levels. Specifically, I'm talking about your estrogen/progesterone ratio. Generally the higher your level of estrogen (either in the serum or at the receptor level (7)) the more likely you are to develop acne. ​If you have hypothyroidism (especially if you have hormonal issues like PMS/PMDD) then an important part of treating your estrogen/progesterone levels will be treating your thyroid properly. Most women know if their acne is due to hormonal issues because it tends to come and go with their cycle, their mood and it is in a very distinct distribution on the body. If high estrogen levels make your acne worse then you need to focus on balancing your progesterone levels and increasing the metabolism of estrogen in your body. This will allow you to simultaneously bring DOWN your estrogen while you bring UP your progesterone. Androgens include DHEA, Testosterone and Testosterone Metabolites. Women with high levels of any of these may present with acne (10), oily skin and changes in mood or behavior. ​What you may not have realized is how to properly treat testosterone issues. Most of the time high testosterone in a woman is due to changes in insulin levels. So the treatment of acne due to high testosterone is usually directed at the underlying cause - in this case, high insulin levels. ​Extra hair growth on the face, discoloration of the skin (usually dark), changes in mood, weight gain or weight loss resistance and acne. ​The treatment then comes addressing insulin resistance and improving testosterone metabolism AWAY from the DHT (the most potent androgen). ​While there are many reasons for acne there is no denying that many people have basic nutrient deficiencies that can be preventing proper function in the skin. Your skin requires certain nutrients (11) to function properly and deficiencies in nutrients can lead to acne. ​This may explain why changes in diet can improve acne (by providing these basic nutrients in the form of food). It's also why you see certain supplements being touted as the BEST natural acne supplement. Zinc - Zinc plays a key role in skin health and many patients are also deficient. It can help boost the immune system, acts as an anti-inflammatory and also helps testosterone metabolism. Omega 3 fatty acids + FCLO - Omega 3 fatty acids help reduce inflammation and have been shown to reduce inflammatory acne in some studies (12). Vitamin A - Vitamin A deficiency is probably one of the most common nutrient deficiencies leading to skin problems (13) and I've successfully used vitamin A in isolation to help many patients clear up their skin. It packs a punch and it's a fat soluble vitamin so you need to be careful with dosing, but as a point, the drug Accutane is basically high dose internal vitamin A.
Vitamin K2 - Vitamin K2 and other fat-soluble vitamins can dramatically improve complexion, promotes healing of scars, decreases pore size and reduce inflammation. Vitamin K2 is another nutrient that many people tend to be deficient in due to not eating enough organic, or grass-fed meats/dairy products. ​There's no question that imbalances in your gut can promote and perpetuate acne, pimples and other changes in your skin. But how do you know if your gut is involved in YOUR acne? The great thing about gut imbalances is that you almost always have some sort of symptom. The combination of symptoms above + acne (especially if cystic) paints a picture that your gut is involved. This is also very important when we talk about hypothyroidism. Thyroid hormone is involved in promoting the constant motion of your GI tract known as peristalsis. Low thyroid hormone (AKA hypothyroidism) promotes slower GI tract movement which sets the body up for constipation, small intestinal bacterial overgrowth, small intestinal fungal overgrowth, increased intestinal permeability and changes in the gut microbiome (bacterial concentration). It's these changes that then lead to acne and skin changes. Sometimes it's enough to just fix thyroid function and that will often promote proper gut function which can then help acne. Other times (I would argue most of the time) some sort of intervention is required to fix the damage caused by the changes from hypothyroidism. Remember that the thyroid is involved in MANY different physiologic functions in the body, so low thyroid can impact MANY organ systems. Patients and Doctors usually (wrongly) assume that by simply adding thyroid hormone back into the body all of those imbalances will fix themselves. That turns out to be wrong for MOST patients. And it's this kind of thinking that leads to the "thyroid as the cause of all problems in the body" mentality, which in turn makes patients feel that more thyroid hormone is the answer to all of their problems. If basic interventions don't work you may ultimately benefit from advanced stool testing to get a better idea of what is happening. This one goes without saying but I'm going to mention it anyway. If you aren't already eating organic, grass-fed or free-range it's time to make the change. Stress - High levels of stress (14) are associated with WORSENING acne. Get that stress under control either by adding coping mechanisms or by eliminating the source from your life (if possible). Diet - That means organic, grass-fed, free-range types of food. Avoid foods that cause you physiologic problems (15). I can't tell you the number of people who tell me that dairy makes their stomach hurt and yet they still consume it. Why? If a certain food causes you issues, eliminate it from your diet! Water - Drink 64-128 ounces of water PER DAY (more with activity). Cellular hydration is requisite for proper function, so don't miss out on the easy opportunity to hydrate and allow for proper cellular function. Exercise - I want you to stay active because I want you to sweat, sweating will help your body eliminate any unwanted metabolites that you may come into contact with. I'm specifically talking about halogens which can cause acne like pustules as they e﻿﻿﻿xit the body. In addition to putting the right things INSIDE your body, you will also want to place some high-quality vitamins and nutrients on the outside of your skin. The two vitamins I am referring to including Vitamin A (retinol) and Vitamin C.
There is no way for your skin to naturally produce Vitamin C unless you place it on your skin with certain substances. Even if you consume Vitamin C your body will break it down and it will never actually make it to your skin cells. For this reason, it's important to use a nourishing Vitamin C serum to get this vital nutrient directly into your skin cells. Vitamin A (retinol) is another very important nutrient that you can also directly place on your skin. Retinol helps normalize sebum (oil) production and can also help reduce the effect of androgens on your skin (your hormones). For these reasons, I recommend that you use 2 very high-quality serums that apply both Vitamin C and Vitamin A directly into your skin. Vitamin C serum - For best results, this should be in the L-ascorbic acid form, with at least 15% concentration and at a pH of 3.5. Apply a few drops to your skin in the evening. iS Clinical Active Serum - This serum contains a number of natural and active ingredients which naturally improve the epidermis and build up the dermis below. Use 1-2 drops on your face in the morning (away from the Vitamin C serum). Acne is usually a representation of what is happening on the INSIDE of your body, that usually means some sort of imbalance is perpetuating and causing acne. Treatment should then be focused on fixing the underlying problem, not adding topical treatment to the skin itself. Most cases of acne that I see are either due to hypothyroidism (or some other hormone imbalance) and/or a combination of gut imbalances. Fixing thyroid hormone may not fix your gut imbalance so it's important to consider other causes as well. If you are still struggling with acne make sure to use the 6 steps outlined above for maximum benefit. Is your acne caused by your thyroid?